They said it wouldn’t happen. Several people wanted it to happen. And now it has. Godspeed You! 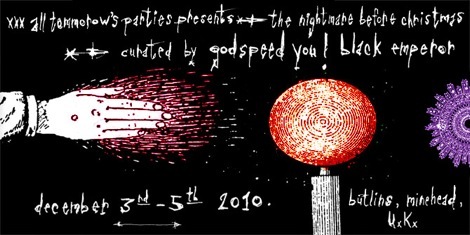 Black Emperor are to reform and curate weekend one of All Tomorrow’s Parties, December 3-5, 2010. Read on for details and interview with band leader Efrim. Getintothis interviewed chief songer-writer Efrim Menuck and talked about the possibility of reforming back in 2008, here’s what he had to say. Meanwhile a statement released by the band said: “After a decade’s retreat, god’s pee has decided to roll again. we are, as always, stoked, stubborn and petrified. between now and the live-dates, there’ll be rivers of noise and distraction. and the internet is a petty tyrannical monster. please remember that really all that matters is the keep on keeping on. and all that really matters is the shows. and physical engagement in the world. and folks like us and folks like you. thanks for understanding, and thank you for still listening. Godspeed You! 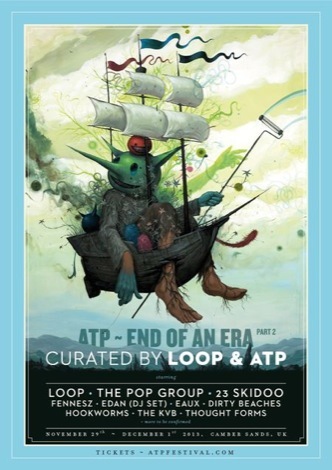 Black Emperor will not be doing interviews or other press for this event. Godspeed You! Black Emperor will perform on all three nights in the Centre Stage venue. As this venue does not hold the entire festival capacity, ticketholders will choose one night for which they will receive a guaranteed entry wristband. Once wristbanded people have entered the venue each night, others will be allowed in on a first come first served basis allowing some people to see multiple shows. Godspeed You Black Emperor: East Hastings.